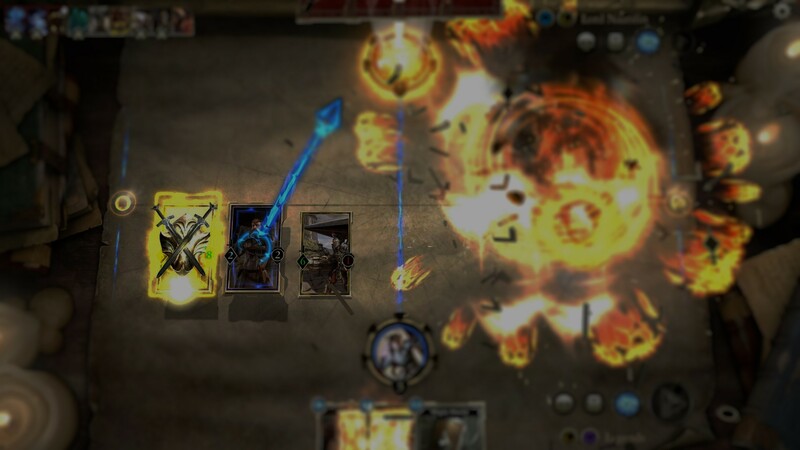 The Elder Scrolls: Legends is unlike any game I’ve ever played before. It encompasses multiple elements from various games I have played or been around in the past and builds upon them in a way that creates something brand new and unique. While the lore of TES is absolutely fascinating in its own right, it’s the game play that really sets it apart and draws me in as a card player. The game itself is still in closed beta, but those lucky enough to get a beta key or have been in the beta since before the NDA was lifted know how much depth and excitement are packed into its seemingly simple engine. Players are finding themselves drawn to the incredibly well designed lane and rune systems that keep us coming back for more. From the minute you dive into Legends the story mode takes you into another world of lore and adventure. You find yourself at a campsite listening to a recollected story of a hero in the seemly not so long ago past. The game then throws you into the deep end as you take on the role of said hero and the fun begins. Unlike most online or physical card games I’ve tackled in the past, this one takes a different route in teaching new players about the game mechanics by focusing on the story (or Legend) and letting the player naturally find their way in the learning process. This is a big step up from most other online tutorials I’ve muddled through in the past since most have left me bored or just clicking the next button in rapid succession to get through and onto the meat of whatever game I was playing. I found myself wrapped up in the story TES: Legends was telling as both the animation and in-game story modules were so vivid and varied. Nothing felt forced and I didn’t once get bored as each episode offered a new experience in teaching me how something worked. The best part is that throughout the story you unlock various bonuses and rewards which you can take with you into the game past the story mode. Everything from new decks, packs, gold, and even legendary cards can all be earned and obtained so that when the story is done and you’re ready to hop online, you’ll have everything you need to start competing right out of the gate without having to spend a dime! Legends is a beautifully crafted game and it’s easy to tell at a first take that a lot of time went into making sure everything is easy to navigate and maneuver. When players first log in they’ll have the options to refine their decks in the collection menu, buy packs or arena tickets at the shop, or head right into play mode to try their hand at the many game modes Legends offers. My first stop was the shop! As with most card games I’ve jumped into in the past, I like to crack a few packs and build up a little bit of a collection to get a feel for what I’m up against. I was immediately a fan as each pack contains six cards and offers a variety of rarities in each pack to get me started. Most packs just contain four or five commons and one or two rares, but you stand a good chance at pulling epics and legendaries too if you crack enough. “God” packs are apparently a thing too which excites me even more. One pack could contain as many as three legendaries and a few epics, or even the famed “six legendary” packs. After opening a few packs it’s time to head to the collection and see what we’ve got. The collection offers a very convenient way to sort your cards you’ve already earned as well as show you what you still need if you want to craft anything in the future. Every card has a Soul value and can be earned by Soul Summoning it with Soul crystals you can earn by leveling up or Soul trapping cards you don’t need. Make sense? It’s pretty soulful. Once you’ve completed the Story mode you’ll have most of the common cards to need to start constructing decks, but the harder to earn rares, epics, and legendaries will probably have to come later by opening packs and leveling up to upgrade cards already in your collection. To build a new deck simply click on the new deck button on the top and start adding cards. You’re limited to two classes however so choose wisely. We have a couple of decks already posted on the site (like this one) so check those out if you need a jumping off point! Strength, Intelligence, Willpower, Agility, and Endurance are the five attributes in Legends. TES: Legends offers a pretty wide variety of game modes for whatever you desire. Solo and Versus Arena are set up in a draft-like format where you pick your classes and then pick one card at a time out of groups of three cards until you have a 30 card deck. Solo Arena pits you against a bunch of computer-controlled opponents which you try to defeat one at a time, earning cards for your deck throughout. You are then awarded prizes based on your overall record. Versus arena is similar except you’re pitted against other players and have to defeat as many as you can before taking three losses or making it to seven wins and you are awarded prizes accordingly. I’ve found both modes to be very fun and the rewards in Versus Arena to be pretty spectacular if you can make it to six or seven wins. Versus Battle is where the real meat of the game is as you can bring your own deck creations into battle and pit them against real opponents all vying for the top of a twelve rank ladder system, with the Legend rank at the very top. The ladder’s construction is crafted in a way that rewards players experience for leveling up as well as making sure that players can’t fall out of their rank once it’s been earned. For instance, say you make it to rank one on the ladder and can’t manage to win another game for five or six games. Instead of falling back to rank two or three, you simply fall into what’s called “the serpent” so that no matter how many games you lose you will only have to win two in a row to make it back to the start of rank one. I can definitely see this being a big incentive for new players as nothing feels worse than earning a high rank only to have a bad day, lose it, and then have to make the long grind back. Legends definitely solved that problem while still making it a challenge for veteran card and online players alike. The game is a lot of fun! Coming from a multiple game background that includes Pokemon, Yu-Gi-Oh, Duel Masters, Kaijudo, and Hearthstone just to name a few, I haven’t felt this good about a game when first jumping in. Legends takes a lot of the best aspects of each of the aforementioned games and combines them to create something exciting with new twists which include the Lane and Rune system. For an in-depth look at the Rune system, check out CVH’s article here. The two lanes offer a whole new layer of strategy and leave a lot to explore in finding optimal lines of play throughout a game. The base set has done a great job at offering a ton of individual card strategies while leaving the door wide open to new layers and possibilities in card designs to come and as someone who sees himself sticking with this game for a while, that makes me extremely excited. I’m very eager every day to jump in and see what new possibilities I’ll stumble upon in my next game. As the game continues to grow expect to see more in-depth analysis on my part of certain game features, card strategies, and reviews in the future. I hope to see you all on the ladder real soon! Carl Miciotto aka EarthP0w3R is a long time gamer and content organizer. Previous competitive experience includes Pokemon, YuGiOh, Duel Masters, Kaijudo, and Hearthstone.